With three piers (200 meters, 170 meters, and 140 meters in length) and a water depth of 9.20 meters, Port Akdeniz is fully equipped to serve the increasingly greater number of cruise liners plying the Mediterranean in recent years. In Port Akdeniz, an industrial harbor, there is nothing of interest. There is an information desk and cafe in the terminal building. 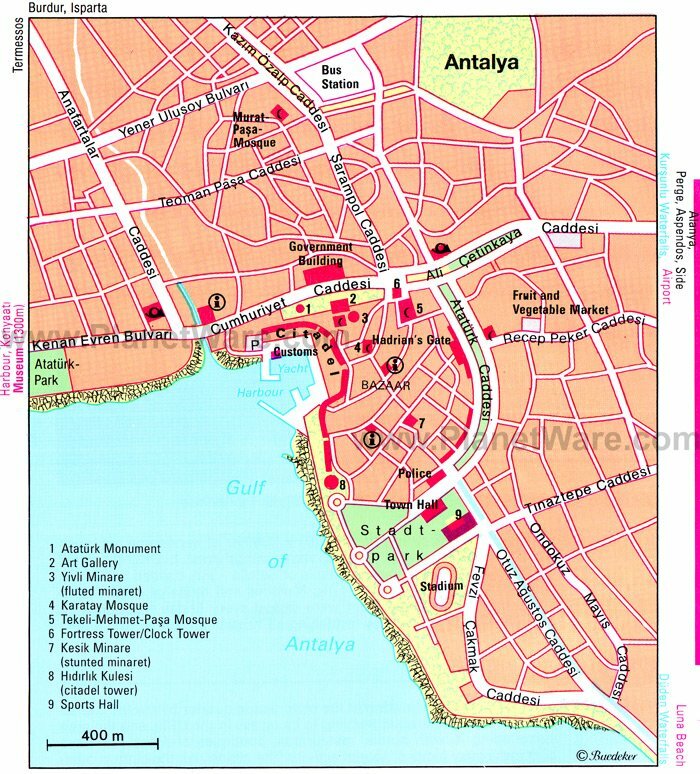 Located some 9 miles west from Antalya's historic center and small harbor. Transfers to Antalya are normally provided by the cruise line. Taxis are waiting at the port, a one-way ride to Antalya is about 25 euro per taxi. The city was founded as "Attaleia" (Ancient Greek: ?tt? ?e?a), named after its founder Attalos II, king of Pergamon. Antalya, Turkey's principal holiday resort in the Mediterranean region (ancient Pamphylia), is an attractive city with shady palm-lined boulevards, a prize-winning marina on the Mediterranean. In the picturesque old quarter, Kaleici, narrow winding streets and old wooden houses abut the ancient city walls. The sandy Lara Beach lies about 12 km to the east. Closer to Antalya, but to the west, the long, pebbled Konyaalti Beach offers a view of the breathtaking mountain range. A little further the Bey Dagi (Olympos) National Park and Topcam Beach provide more splendid vistas. The Archaeological Museum is one the Turkey's best and largest. The (historic) tramway has been donated by the German city of Nuremberg and connects the western Konyaalti Beach and Antalya Museum to the eastern part of the city center. It runs all 30 min. in either direction and costs 1.75 TL per person. Tramway can be used for sightseeing as it passes most beautiful places of the city center. In town, a taxi is cheap, and the fares are regulated. They are easy to find. For long journeys, however, drivers can charge more than the meter reads. So negotiate the fare in advance. The most unusual transportation in Turkey is called Dolmus for routes that buses don't take. The word actually means "To Fill"; thus, the dolumus leaves when it is full! They are usually a minibus, a jeep, or a van so they fill quickly. A bonus is that they will drop you off along the route. Other historical sites around Antalya are: Perge(18 km), Aspendos and at 80 km Side. Antalya has three different types of shopping areas. First, the shopping within the walled Old City is wonderful. The maze of pedestrian streets is lined with shops selling everything imaginable. The Antalya flea market some 3 blocks to the east of the east side of the walled city is huge and offers tons of local crafts. Finally, the shops lining the ocean front streets and neighborhoods offer myriad shopping opportunities. Free wireless connections are available in port.